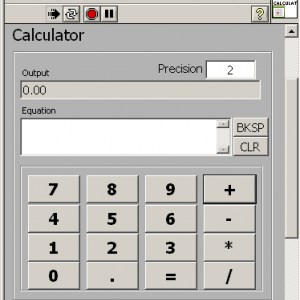 search for the "Calculator XControl_LV2010" support page. Compatible LabVIEW Versions: >= 8.6. 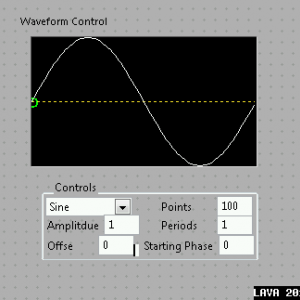 This package uses two instances of my Waveform XControl to make a vector waveform - i.e. magnitude and direction or x and y co-ordinates. 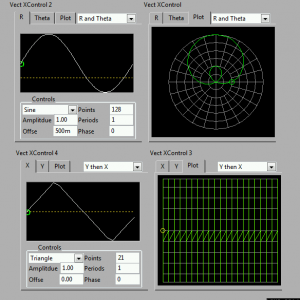 The resultant vector waveform is plotted on the third tab of the Xcontrol. The XControl can be switched between polar or cartesian co-ordinate modes and it is possible to vary both co-ordinates together or repeating one for every point on the other - thus allowing 2D scans to be built up. The waveform is represented as a complex number where the real co-ordinate corresponds to the X axis and the imaginary to the y. I use this in my own code to allow users to control both a vector magnet and to setup a laser scanning system. data type. Supports sine, square, ramp, saw tooth and arbitary functions with djustable amplitudes, offsets, and number of periods with no further coding. User interface provides a graph that updates in response to user changes to the controls. XControl will adjust layout as it is resized, and provides properties to set the vivisbility of the axes scales, y=0 marker and a current index position marker. This tool allows XControl to (seemingly) natural inherit properties from their daughters. Version 1.1 includes better documentation (F1), and is better structured and more fail save.This program will allow the generation of Inheritance for XControls. It offers the option to generate new XControls fit for this tool. Installation via .OGP with OpenG Commander (http://commander.openg.com) or VI Package Manager (http://www.vipm.com/vipm). 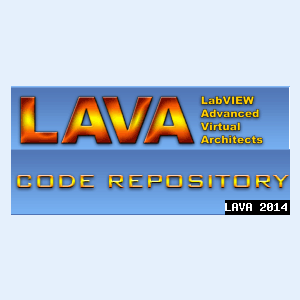 1.0.7: Initial LavaCR release of the code. This XControl has a configurable apperance, functioning as a boolean it can show a custom picture with a custom (formatted) text. 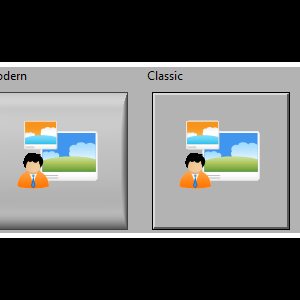 On initial drop of the XControl it will show a browse window to load a picture (png, jpeg or bmp) as view of the boolean. After that the GUI configuration of the XControl is shown where the position of string an picture can be set amongst other things. The button itself can be a Modern, Classic, System or System Decoration style. Unzip to a custom location. You have to manually add it to your palette, since LabVIEW won't index XControls. To hide the use of the XControl to developers you should lock the facade vi (Abilities\BX.Facade__LCR.vi) so the 'Show diagram' options isn't shown. 2.1.0 (6 may 2009): Fixed a bug that closed up the project when it was closed when a VI with the Boolean XControl was still open. 2.0.12: Changed the default lettertype to be the first one, size 10. 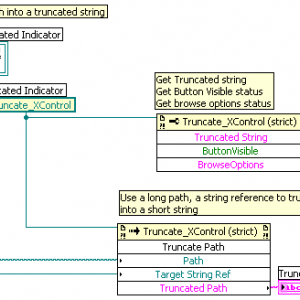 It will truncate a path to fit inside a (multiline) string. An XControl with enhanced features for the multi-column. To access X-Control features select More… from the shortcut menu. 1.2.0: Fixed edit cell behaviour. Improved ability to convet older versions. 1.1.0: Added more commenting. Fixed bug in cell editing of column headers. Added saving of adjusted column widths. Added example vi. I have had many people ask for an LED type indicator for their project. During development, I often get asked to have this Boolean (ie 2 state) indicator display one of (more than 2) colours. Whilst that in itself is not difficult, more often than not I am then asked to make the Boolean LED flash as well to highlight certain states. I have had so much demand for this functionality, that I decided to develop this XControl and share it with the LabVIEW Community. Many thanks must go to Aristos Queue and his inspiring "Scrolling LED XControl" example. This XControl is a typical Boolean LED indicator that can also be configured to flash between two user defined colours. The flashing interval can also be modified. When not flashing, the XControl behaves as a normal Boolean LED. This XControl is an indicator only is is not intended to be used as a control. If you save this code for version 8.0/8.2, you may encounter issues trying to assign multiple properties in one property node. Copyright © 2009, Technogerma Systems France S.A.R.L. This project is a technology preview of a simple gauge LabVIEW XControl limited in features and visual aspect. The XControl is based on a C wrapper on our Graphical Instruments Solution (GIS). The purpose of this technology preview is to see if such a library of XControls could be usefull and to get feedbacks from LabVIEW users community. Not yet available. If you are interested in a Linux or Mac version please contact us. - Performance issue when the value change rate is too fast. This will introduce a desynchronization between the current value and the displayed value. This is due to the XControl architecture that stacks data changed events. See http://forums.lavag.org/XControl-DataChanged-events-stacking-t13459.html for more details. If you have questions or if you want to give some feedback you can send mail to gisxcontrol@technogerma.fr or post directly on GISXControl LAVA support forum thread. Copyright © 2009, Martin Weiss. Implements a blinking LED with adjustable blinking interval. The value of this XControl is the blinking interval in milliseconds. Minimal value allowed is 100ms. This XControl acts as an indicator only. Inspired by Aristos Queue's "Scrolling LED XControl" example. Many thanks for that! Copyright © 2007 SAPHIR (Olivier JOURDAN) All rights reserved. Use capacity indicator to provide information about the level or amount of something that has well defined minimum and maximum values. For example, you might use a capacity indicator to showthe current level of storage-space usage on a server or the charge left in a battery. Just unzip the code into any folder of your choice and select the file "CapacityIndicator.xctl" as a control. * 2.0.1 : Initial submission to LAVA CR. Copyright © 2007, PrimeTest Automation, Inc. This code has been tested to run under LabVIEW 8.2.1 and 8.5.0. Just unzip the code into any folder of your chosing and select the file "IP Address.xctl" as a control. If you have any problems with this code or want to suggest features, please post to the LAVA forum. Fixed vertical resize (very short) on drop in 8.2. Added support for backspace and delete. Using character values instead of scancodes for key down filter event. Learned that the decimal point in the keypad and the delete key have the same scancode. Added documentation to the XControl properties.